* They are not exactly equal because some energy goes into chemical bonds and some additional energy is supplied by radioactivity and by thermal cooling of the Earth's interior. For the Earth, the heat flow from the interior is approximately 0.004% of the energy received from the Sun. The albedo of an object is the fraction of the incident energy that is reflected back into space. (The word is also used for the reflected radiation itself.) The garth's albedo is approximately 0.30, although it fluctuates considerably because clouds and ice reflect more light than the land or water surface. The spectral characteristics of the reflected radiation are approximately the same as the incident radiation. (See the solar radiation discussion in Section S.3.) Thus, the Earth's albedo is most intense in the visual region of the spectrum, i.e., the region to which the human eye is sensitive* from about 0.4 to 0.7 pm wavelength. The appearance of the Earth in the visible spectrum is described in Section 4.1. The incident energy which is not reflected from the Earth is transformed into heat and reradiated back into space with a black body spectrum characteristic of the temperature. The Earth's mean surface temperature of approximately 290°K corresponds to a peak intensity of emitted radiation of about 10 jum in the infrared region of the spectrum. Section 4.2-describes the appearance of the Earth in this spectral region. The mail} advantage of using this emitted, or thermal, radiation for attitude determinatipn is that the intensity is much more uniformly distributed over the disk of the E&fth. In both Sections 4.1 and 4.2 the Earth is assumed to be spherical. Section 4.3 then describes the oblateness of the Earth and oblateness modeling techniques. Finally, Section 4.4 describes the structure of the upper atmosphere, which is the major source of environmental torque for low-altitude spacecraft. 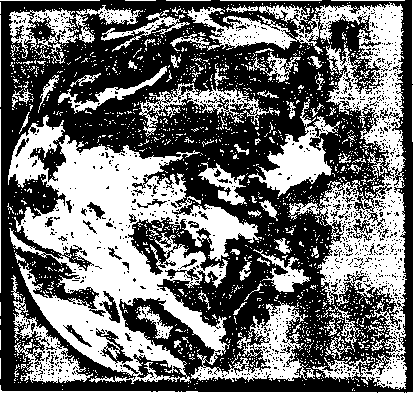 Figure 4-1, taken by the SMS-1 spacecraft in July 1974, shows the appearance of the Earth in the visual region of the spectrum. The location directly beneath the spacecraft is called the subsatellite point* on the Earth or the nadir direction as viewed from the satellite. The subsatellite point for Fig. 4-1 was on the equator at about 50 deg West longitude, on the coast of northern Brazil. Thus, the equator runs through the center of the picture approximately parallel to the lower edge. The outline of the eastern shore of South America is at the center and northern Africa and Spain are visible in the upper right. Cuba and Florida are on either side of a narrow cloud bank in the upper left. 'The term subsatellite point may be applied to two distinct points on the Earth's surface: (1) the point for which the satellite and the center of the Earth are in opposite directions, or (2) the point from which a line to the satellite is perpendicular to the oblate surface of the Earth. We will use the first definition unless otherwise stated. At the time that the photograph was taken, the Sun was directly overhead at the subsolar point at approximately 85° West longitude, 20° North latitude, near the western tip of Cuba. If the satellite is far from the Earth relative to thè Earth's size, and if we think of the Earth as a mirror rather than as a diffuse object, then the reflection of the Sun would appear at a point midway between the subsatellite point and the subsolar point. This specular reflection is responsible for the indistinct bright region (about 3 cm in diameter) along the northern coast of South America, where the boundaries between land, water, and clouds are difficult to distinguish. During the course of 24 hours, the subsolar point remains.at nearly the same latitude but rotates through 360 deg in longitude. Thus, the north polar regions are continuously illuminated and the south polar regions are continuously dark. The situation is reversed when the Sun crosses the equator in late September. The terminator is the boundary between day and night on a planet or a planetary satellite and is approximately a great circle 90 deg from the subsolar point. This is the fuzzy right-hand edge in Fig. 4-1. Because the principal requirement for attitude sensing is to trigger on a well-defined boundary, the very poor definition of the terminator is the best reason for not using visual sensors for attitude determination. However, terminator modeling is required for several purposes, as discussed below. where h is the height of the spacecraft above the surface and R® is the radius of the Earth. Equation (4-3) was used to construct Figs. 4-3 and 4-4, which show the distortion of the Earth as viewed from space and the path of scan lines of three spacecraft sensors, shown as dashed lines in the two figures. 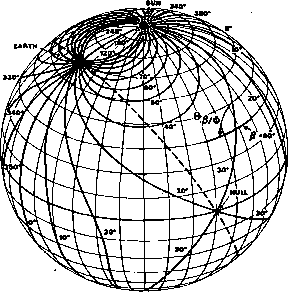 Figure 4-3 illustrates a globe of the Earth showing the portion of the surface viewed by a spacecraft at a height, h, of 987 km over the equator at 70° West longitude such that A=30° and p=60°. 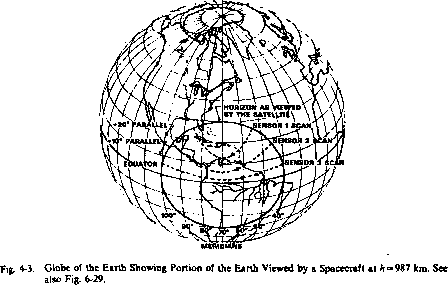 Figure 4-4 shows the celestial sphere as seen by the spacecraft, including the visible features on the Earth's surface. The spacecraft attitude is toward the north celestial pole with sensors mounted at 40 deg, 60 deg, and 80 deg relative to the attitude; the arrows indicate the direction of scan. 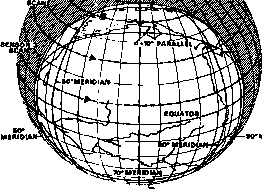 Note, particularly, the shape of the ground track of the sensors and the shape of the Earth meridians and parallels of latitude as seen by the spacecraft. Modeling the Terminator. For the purpose of attitude determination and control, the most important feature of the Earth in the visible region of the spectrum is the terminator. Although the terminator is not normally used as a primary reference for attitude determination, it may be necessary to model the location of the terminator as seen from space for several reasons: (1) to verify coarse attitude or to determine the azimuthal orientation about the nadir (both were done for RAE-2 [Werking, et a!., 1974; Lerner, et al., 1975]), (2) to determine the general level of illumination as it affects various attitude sensors (such as star cameras), and (3) to eliminate spurious horizon crossings due to sensor triggerings on the terminator. Section 9.3 includes a detailed discussion of tests for the identification of horizon crossings in attitude data. Fig. 4-4. 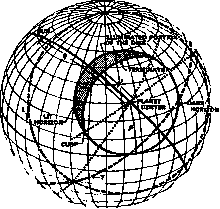 Celestial Sphere as Viewed by the Spacecraft Showing Distortion in the Appearance of the Portion of the Earth Viewed. Same parameters and horizon as shown in Fig. 4-3. Note the distortion in features and right/left reversal. See text for explanation. At best, the expressions for £ are average values. The correction terms are normally dominated by local effects such as terrain (e.g., valleys where sunset is early and mountains where it is late) and albedo variations depending on both the nature of the surface and the local weather. In order to model the position of the terminator as seen by the spacecraft, let be the correction terms in the dark angle, A£=90° — let p be the angular tadius of the central body as seen by the spacecraft; and let ij/ = 180°-a+A|, where a is the angle at the center of the planet between the Sun and the spacecraft. Fig. 4-6. Terminator Geometry. V is negative when the plaqet is less than half lit, as shown. 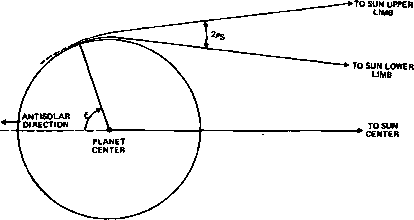 The orientation of the cusp, i.e., the intersection of the terminator and the horizon as seen by the spacecraft, may be constructed geometrically as follows: Construct the small circle, T, of radius £ centered on the Sun, and the small circle, L, of radius (90° - p), centered on the disk of the planet. Then the two great circles connecting the center of the planet to the two intersections of T and L cross the horizon of the disk of the planet at the cusps, with the proper horizon crossing chosen by inspection. As indicated at the beginning of Chapter 4, infrared radiation from the Earth is thermal radiation from both the surface and the atmosphere resulting from the heat generated by the absorption of sunlight. 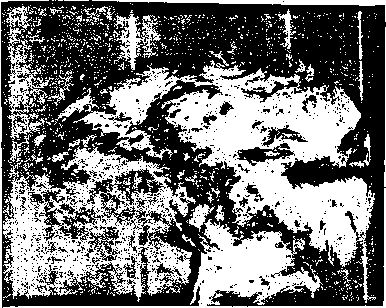 Figure 4-7, taken by the SMS-1 spacecraft at 14:00 UT, November 18, 1974, shows the Earth in the infrared region of the spectrum from 10.5 fim to 17.6 fim. The subsatellite point is near the equator at approximately 285 deg East longitude, near the point where the borders of Peru, Ecuador, and Colombia meet. Geographic features are difficult to distinguish in the infrared. The western shore of South America runs vertically down the center of the bottom half of the photograph. Northwest Africa is the well-defined region on the right-hand edge and the Great Lakes are clearly visible 1.2 cm from the top of the photograph. smoothed by the absorption and gradual reradiation process. Results from the analysis of spacecraft data by Lyle, et al.,  indicate variations in the albedo between 0.10 and 0.80 and infrared variations over the more limited range of 105 to 350 W/m2. Similarly, the maximum diurnal infrared variation is only ± 15%. Table 4-1 at the beginning of the chapter shows that global averages for each season vary from the annual mean by 10% in reflected radiation and 3% in emitted radiation. Regions which reflect the most solar radiation (clouds and ice) are brightest in the visual region. However, because they absorb less energy, they are cooler and radiate less in the infrared. Thus, in contrast to the visual region, the cooler cloud tops and polar caps are dark in the infrared and the warmer, dark-colored, vegetation-covered surfaces are light. The spectral energy distribution of the emitted infrared radiation is affected by the temperature and, more importantly for the Earth, by the chemical composition of the atmosphere. Figure 4-8 shows the average spectral distribution over midlati-tude oceans (solid line) compared with various black body spectra (dashed line). Note the strong absorption bands due to COj, 03 (ozone), and H20. In each of these bands radiation is being absorbed and isotropically reemitted by atmospheric molecules. Thus, at these wavelengths it is the atmosphere above the surface which is being viewed.